Right outside Grebbestad, West Sweden, you will find the mythical and original European oyster Ostrea Edulis, also called Belona oyster. There are those who claim that the oysters from the area are by far the best in the world. One of those who has pronounced this, is the Michelin star chef Paul Bocuse. Another master chef that Skärgårdsidyllen Kayak & Outdoor have had the opportunity to paddle with and showcase the oysters in the area, is Swedish cheTareq Taylor, known from the serial Tareq Taylor’s Nordic Cookery (broadcasted in more than 100 countrys) amongst others, who like us, has a great love for the ocean and all you will find within. From Grönemad just outside Grebbestad on the Swedish West Coast, where you will find Skärgårdsidyllen Kayak & Outdoor, where is it just a couple of paddel strokes to the wild oyster banks. You will safely float over the wild oysters, feel the saltness in the air and see the oysters on the bottom of the ocean in their own habitat. Grönemad is in the middle of the heart of the area between Hamburgsund in the far south to Strömstad in the far north, a stretch of 60 kilometers, where approximate 90 % of all the Swedish oysters will be harvested. During the oyster paddling tour you will familiarize and learn about the oysters in its own habitat. We will learn how to identify different species. We will also make a short break on an island to have the opportunity to try an oyster. It will be a memorable oyster tasting. The oyster paddling tour including the oyster tasting will take approximate 3 hours. The best time to eat oysters, like all other seafood, is the months who includes the letter R, in other words from the beginning of September throughout the month of April. Since the demand is high and an oyster is always an oyster, the trip will be made on request all year round. Ingela Holgersson, who has grounded Skärgårdsidyllen Kayak & Outdoor with her husband Marcus, has grown up in Grönemad and comes from a fisherman and stonecutter family with the roots in Bohuslän, West Sweden. Ingela’s dad was a fisherman and Skärgårdsidyllen Kayak & Outdoor has its kayakcenter in his old fisherman cottage. Already at the age of 10, in the early 1980s, Ingela and her family established one of the early mussel farms in Bohuslän, West Sweden and at the age of 11, she and her big brother ran a successful eel fishing business during the summer holidays. A business that was replaced by summer jobs on the shrimp and crayfish trawler June af Grönemad at the age of 14 . It was fun summer jobs that gave experiences by hand about the ocean and what’s living in it and epic nature experiences that will last for life. 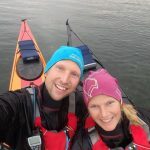 In 2011 Ingela returned to her homestays with her husband and family and they started Skärgårdsidyllen Kayak & Outdoor. 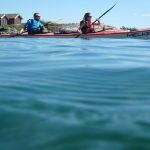 Now again, the family lives in harmony with the ocean and Ingela is one of Skärgårdsidyllen Kayak & Outdoor‘s appreciated guides who share the experiences, for example during the Ostron paddling tour. Marcus Holgersson, who is the other half of Skärgårdsidyllen Kayak & Outdoor, comes in turn from an ocean pilot family with roots in St Annas archipelago on the Swedish East Coast. It has therefore been easy for Marcus to take advantage of his experiences and to convey the local knowledge of the ocean and culture easily and will guide you in an amusing and fun way. No previous experience of kayaking or oysters is required. The trip itself is an introduction to kayaking, where we continuously train the basic skills you need. However, we assume that you know how to swim and is at least 15 years old. Please, bring water, sun protection, swim/neoprene shoes and extra clothes just in case you would get wet. The price includes all necessary paddle equipment (kayak, paddle, spray skirt and life vest) as well as guide and basic instructions. The price also includes demonstration of how to open oysters, an oyster and a non/low-alcoholic beverage. Price: 1 250 sek a person ink. 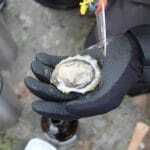 guide, fully equipped kayak and an oyster tasting.